During his four years at Louisville Parker proved to be a dynamic playmaker at the wide receiver position, improving his receptions, receiving yards, and touchdown receptions in his first three years on campus. Many draftniks thought that Parker was ready to establish himself as one of the premier wide receivers in college football, but with the loss of quarterback Teddy Bridgewater to the NFL, and a foot injury that sidelined Parker for half the season, he was unable to show off his talent. When Parker did return from the foot injury, he started showing signs of being back to the player he was pre-injury, positing a 43/855/5 line in just 6 games this season. I know that foot injuries can be tricky for wide receivers due to the stress playing the position puts on a player's lower extremities, but with Parker being able to play the second half of the year with no setbacks, GM's should feel comfortable investing a premium pick on Parker. Parker has underrated speed for his size, and has shown the ability to both separate down the field and make the tough catches with defenders around him. Parker also does a very good job using his wide frame to gain separation in the intermediate area of the field. Parker has very quick feet, and should not have a problem separating from bigger, press-type corners that the NFL has been looking for lately. While Parker is a good route-runner, he needs to do a better job using his hands fighting off defenders, as well as staying square and sinking into his break. In my opinion Parker has the tools to eventually put his name in the conversation as one of the premier wide receivers both from a team and fantasy perspective. As far as his rookie season, I would expect Parker to come in and make an immediate impact for whichever team is lucky enough to land his services. While both Benjamin and Evans did produce double-digit touchdown's during their rookie seasons, they were only able to crack the century-mark for receiving yards three times. The lack of consistency in their yardage totals make them touchdown-dependent WR2/3 fantasy options during their rookie seasons. With Parker, you get a player that is a better athlete down-the-field than, has more consistent hands, and will likely go to a team with an established quarterback. Like Benjamin and Evans, I expect Parker will be a touchdown dependent WR3 fantasy option to start the season, with the potential to move depending on where he lands in the draft and how he progresses during OTA's and mini-camps. Earlier I compared Parker's game to the style of Bengals star wide receiver A.J. Green. While that is high standard for any player to try and reach, I feel that if you look a little closer at their production in college and the progression that Parker made during his college career he has the potential to be the same caliber of player. Green was the more consistent college player totaling over 50 receptions and 800 receiving yards during in all three seasons in Athens. It took a little it longer for Parker to make an impact for the Cardinal program as he did not see a full-time role until his sophomore season. As you can see by the chart above Parker is a touchdown machine. Parker posted double-digit touchdowns in his sophomore and junior season, while posting an absurd 17 yards-per-reception over his career. Parker has a firm top-15 grade for me, but could potentially land anywhere within the first round if teams deem White or Cooper better fits for their offense. A lot of rumblings have Parker being slotted at the number 11 overall pick, joining forces with his old college quarterback Teddy Bridgewater in Minnesota. As a Vikings fan I would not complain about the outcome, but I deem it unlikely as of now. With head coach Mike Zimmer’s intention on establishing an elite defense in Minnesota, I expect GM Rick Spielman to find his coach another toy that he can pair with young talents like Harrison Smith, Xavier Rhodes, Anthony Barr, and Everson Griffen. After that, you can pretty much throw a dart board at any team in the first round that has the need for a talented pass catcher, as I could see Parker going anywhere from the number four overall pick to the Raiders, to as far back as the Chargers selection at nineteen. If Parker is able to test well at the combine and pro day I would not be surprised if Parker puts himself in contention to be the first wide receiver taken come April. We at FantasyFootballHelpers.com are excited to be newly affiliated with DraftKings and we’d like our followers to become affiliated as well. If you’re not familiar with how DraftKings works, let me take a moment to explain the basics before we get into strategy. DraftKings assigns each player with a dollar value and allows you a salary cap of $60,000 to create your preferred team. Each team consists of a QB, 2 RBS, 3 WRs, a TE, a flex and a Defense. Basic PPR scoring is used and rewards are given for 300 yards passing and 100 yards rushing/receiving. DraftKings runs a multitude of contests where you are going head to head from with anywhere from 1 person to 75,000 people! My favorite contests are the ones where I can invest something meaningless like $2-5 and come away with prizes of $10,000-$25,000. They also run the Millionaire Maker, a $27 contest where first place is $1 Million!!! There are many contest options with differing strategies for each, but I’d like to share with you my preferred strategy for selecting a lineup when entering these larger contests. Knowing the injury report is vital to winning these large contests. DraftKings values players based on previous performance so for example if we know that Jamaal Charles is anywhere from out to questionable we’ll want to monitor his injury and after we’re sure he’s out, go ahead and insert Knile Davis into the lineup regardless of his matchup. In this example, Davis would be purchased at a backup RB price but have potential to give you high end RB1 numbers regardless of matchup. Davis is a known stud when he gets an opportunity to play, but other backup players should be judged on a case by case basis by looking at the matchup, and previous success when given an opportunity. Basically if the player in question has a chance for a big game and can be had at backup value you must have them in your lineup. You’ll then be able to load up on other stud “sure things”. For questionable players and/or game-time decisions, it's important to constantly refresh the injury report before gametime until there is a definitive designation of “out”. Knowing injuries on defense is equally important. While DraftKings does provide you with the opponent’s ranking against each position, it does not adjust for injuries on defense. Obviously if J.J. Watt or Richard Sherman is hurt, then the Houston and Seattle defenses will suffer and players against those teams should be upgraded. Selecting a QB/WR/TE on the same team allows you to score 2 TDs on one play. 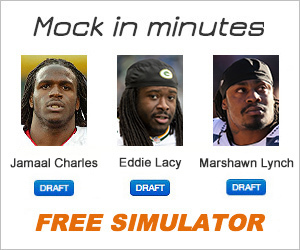 I usually start with the QB selection and choose my favorite WR on his team. In daily fantasy we’re looking for the quarterbacks who can feasibly throw for 300 yards and 3+ TDs on a given day. This always includes the group of Andrew Luck, Peyton Manning, Aaron Rodgers, Peyton Manning, Drew Brees, Russell Wilson (not a 300/3 guy but can run for 50-100 yds) and Tom Brady regardless of matchup but keep in mind they will always be priced high. I’m not opposed to selecting them, but I also like to also take a look at the next tier of QBs that includes Tony Romo, Eli Manning, Ben Roethlisberger, Philip Rivers, Matt Ryan, Matthew Stafford, or Joe Flacco and take a close look at their matchups. If any of them are against a defense like a Philadelphia, Atlanta, Jets or TB that gives up monster passing stats then I’m inclined to save some money at the QB position and go with the second tier QB. If the matchups don’t seem particularly great for the second tier QB, I’ll choose my favorite matchup from the first tier of QBs. Whoever I choose at QB I will pair them with the best WR/TE option on that team. I love to choose running backs involved in blowouts on both sides. The obvious choice is to choose the typical workhorse who will get 25 touches in a blowout therefore racking up yards and goal line carries i.e. Marshawn Lynch at home vs. the New York Giants. This is obvious enough and getting two of these types of backs is fine. If money is getting tight then my other strategy is to select a RB who catches a high volume of passes in a game where their team is projected to be blown out. The receptions add up in PPR leagues and selecting a RB who can catch 6-10 passes and get in the endzone in garbage time can pay dividends. A high cost option in this scenario would be Matt Forte, while medium and low cost options include Daniel Herron and Fred Jackson. Also, do not choose a RB from the same team you’re selecting your QB/WRs. We’re looking for as many multiple TD games as possible for our lineup and there are only so many TDs to go around for one NFL team. In these large tournament formats, we’re not looking to play it safe. We want that top prize and should therefore take a shot on the low cost big time play makers at the WR position. Based on the rest of the roster we’ll need one or two of these options. Hitting on these selections is the most important factor in winning huge prize money. Those who hit on Martavis Bryant, Kenny Stills, Donte Moncrief, or Mohammed Sanu in their big time performances from this year were well on their way to winning big money. This position provides the highest upside and the lowest cost. Researching how teams perform against number #2WRs-#4WRs can help you determine who may have the best chance of breaking out in a specific week. The whoever plays against Jacksonville rule applies here. But specifically you don’t want to spend so big on your skill position players that even you yourself know that you’re most likely picking a defense that should not score a lot of points. It’ll be exciting to look at your lineup and gush over the talent up and down the roster but when your defense throws you a 2 point effort you’ll be out of the running for that top prize regardless of what your offensive players do. Draftkings starts your defense with 10 points and harsh penalties are given for points against. It’ll take a few turnovers sacks and a possible TD for your defense to have a great day so make sure you choose wisely. The difference between choosing a 20 point defense vs. a 5 point defense could be the difference between $1,000,000 and $1,000 or more realistically $1,000 and $10. Tip: Use the weather reports wisely when it comes to defenses. A low cost defense can have a big day simply because it is too windy for any offense to be sustained. Using these methods does not in any way guarantee success. The NFL is extremely difficult to predict on a week by week basis and it will take a healthy combination of skill and luck to defeat thousands of others. Using these tips will give you a leg up on those who do not have a plan in place. DraftKings gives you the ability to view the lineup of anyone in a contest. In order to develop some of your own strategies, view the lineups of the weekly winners to see what has been working for them and if you notice any trends then adjust your lineup accordingly. When the 2015 season begins we will run a weekly column with our favorite weekly DraftKings selctions and value picks. If you have any questions about this article or DraftKings related advice feel free to drop a comment on the Fantasy Football Helpers Facebook page or on Twitter at @FantasyFB_CBASS. In order to join DraftKings or deposit funds while helping us out a bit, you can click on the ad on the right hand side of this page. On Monday's final edition of First Aid for 2014, the Helpers discuss the Atlanta Falcons and their potential to be fantasy juggernauts next season. The Dallas Cowboys impressive fantasy numbers and what exactly went wrong with Andrew Luck. Plus weekly awards for the best and worst of the week.